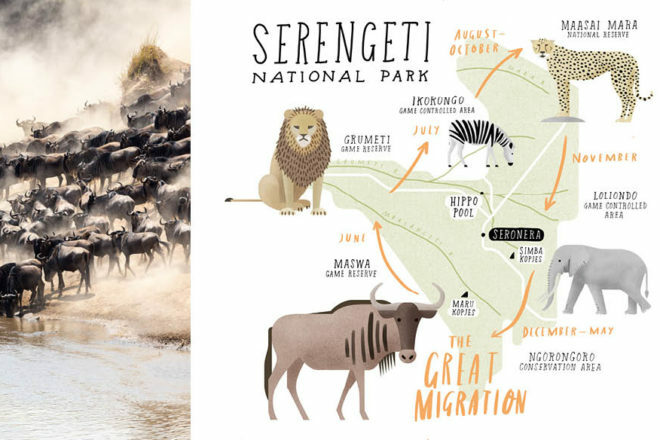 The Great Migration in one of the world's greatest national parks, Serengeti (illustration: Mike Rossi). Serious safari: see some of the world's most amazing animals in the Serengeti National Park, Tanzania. Best things to do in Tanzania’s Serengeti National Park? You can’t go wrong with our curated highlights package, from special wildlife game drives to luxurious safari stays, writes Daniel Down. Driving into the Serengeti is the closest you’ll get to that scene in Jurassic Park when those colossal gates open to the dodgy dino world before Sam Neill and Jeff Goldblum pass through them in a 4WD, not knowing what they’ll encounter. It really is a once-in-a-lifetime experience to be out on the vast savannah, the abundance of wildlife meaning that every minute you don’t know what you’ll see: a parade of elephants, a tower of giraffes, a pride of lions, a million wildebeest on the march. It’s a wildlife photographer’s dream. It’s also home to the semi-nomadic Maasai, their elaborate jewellery, intricate tartan of their cloth Shúkà, synonymous with the landscape. 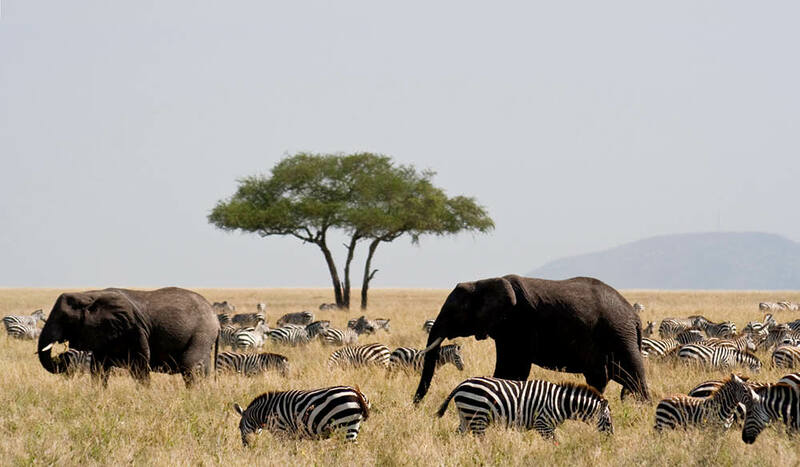 Tanzania has dedicated some 38 per cent of its surface to wildlife conservation, an embarrassment of riches including the likes of the Ngorongoro Crater and Kilimanjaro. The Serengeti is where you will experience the wild Africa you’ve always envisaged, and seeing the world’s most iconic animals roaming in such a vast, beautiful landscape will leave you with a real sense of optimism about our planet. You’ll see hippos wallowing in the waterways running throughout the Serengeti, but there’s a spot where hundreds of them convene to squash together, grunt and aggressively barge each other about – basically everything hippos love to do. At the Retina Hippo Pool you can leave your vehicle and watch around 200 of the beasts from the safety of an elevated bank. Don’t just take images of the wildlife and landscape, get a more in-depth grasp of what’s going on in the national park at the visitor centre, beautifully positioned among the boulders of the Seronera kopjes, in the heart of the Serengeti. The highlight is a walking trail that takes you into the nearby bush, teaching you about the plants, animals and people that depend on the Serengeti along the way. These outcrops of weather-rounded granite that punctuate the plains are an iconic sight in their own right, where you might see a lion surveying its territory. However, get your zoom lens out and you’ll see that they’re a mini ecosystem all to themselves. There are plant species such as the rock fig, that favour these outcrops, in turn supporting small birds, lizards, the wombat-like hyrax and the klipspringer, a small antelope; dung and leaf matter collects in gaps in the rock, which also collect water, eventually forming the nutrients to feed the plants and keep the whole thing going. The largest overland migration in the world is one of the great natural spectacles and you can use our map to be in the right place to spot over a million wildebeest accompanied by zebra, gazelle, eland and impala following the rains. On the flat of the savannah the animals appear to stretch off into infinity, eventually forming a black line across the horizon. If you’re lucky enough to catch the wildebeest making a river crossing, with enormous Nile crocodiles picking them off, you’ll feel like you’re in a wildlife documentary. Africa has the kind of luxury camps where you can prop up the bar with a G&T and be engaged by a khaki-wearing Meryl Streep. 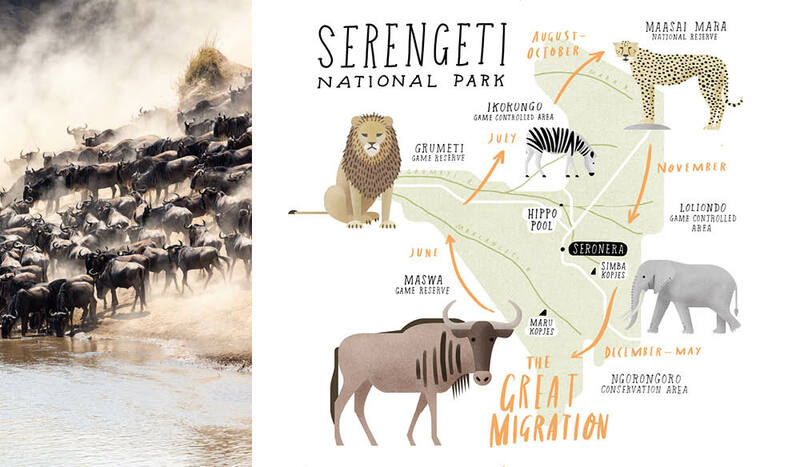 To keep it Out of Africa, try &Beyond’s Serengeti Under Canvas, which (being mobile) can follow the Great Migration. It sounds dangerous to go for a stroll in the Serengeti, but you can experience this exhilarating form of safari. Try Wayo Africa for a great range of tours; imagine the adrenalin of walking the same route that a line of elephants just has. It’s exhilarating to drive out on safari at nightfall, catch sight of lions lying low in the grass stalking sleeping prey, and spot animals like bush babies, bat-eared foxes and aardvarks. And all under the stars of a night sky stretching from horizon to horizon.